In this post: Join me as I answer my journals and give advice to my younger self. Today I’m writing to myself as an Army Wife. This is the third in my Dear Me series. Hello, Dear Ones! Not too long ago we had Memorial Day and in a month it will be Independence Day in the US. So I’ve been thinking about the military life and what it was like. Every time I see a soldier, my mind goes back to the early years of my marriage and my husband’s two deployments to Iraq. I was thinking about the war and how it still affects us. Therefore, I wrote this post. **Please NOTE: this is me writing to MYSELF. I hope it will encourage you but it is not written directly to you. Every Army Wife is different and I can not speak to everyone’s experiences. This letter to my past self is very raw, but the reality of war and what our family went through is very raw. The war never ends…at least not this side of eternity. Don’t lose hope. There is definitely healing for both of you, but the war will live with you. It is best to accept this. The man you married before the war is gone…or rather transformed. The real news is so are you. You will never be the same either. Your son will never be the same. Later in life, you will have another child who has never lived as a military child. He won’t quite get the sacrifice your family has made…our family has made. In fact, many people will forget the sacrifice you all made. They may think the war is over and your family is perfect. We do take nice pictures, don’t we? No, our family isn’t perfect, but it is beautiful. There will be laughter again. Don’t worry. I will always remember your sacrifice. It is still hard to walk through that Operation Iraqi Freedom section of the infantry museum. I still ask our husband if he needs to sit where he can see the door at a restaurant. You will learn to be more compassionate in these areas as you learn about PTSD. As much as you think your hubby will snap out of it after a few years….it won’t happen. Nearly 14 years and the war is still there, but it still affects you too. As much as YOU thought you’d be over the wounds inflicted on your marriage and family by war…well you haven’t. Maybe if it went away you would forget? Maybe you’d take civilian life for granted? Freedom has a cost…whether it is the blood of Jesus or the blood of soldiers. Now you have younger family members in the service and your heart aches for them...for the sacrifices, you know they will make. They have a different war to fight. You will be proud though. You respect them. As angry at the government as you have been over how they experimented on and mistreated your husband….as upset at Veterans Affairs over how they treat vets and the awful things that have happened at Vet hospitals…well, you are still proud of the soldiers and families who sacrifice for you. All of the issues with PTSD and also trying to sort out what is your husband and the what is the war, well don’t let those things eat you alive. You can never completely know which is him and which is the war. They’ve grown together like two vines. Love the man you now have. Marriage can make you holy if you let it. You’re going to die to self and you’re going to have to fight hard for your marriage every single day…every single moment. Please remember that your husband is not the enemy. Also, remind HIM that YOU are not the enemy. He will constantly go through fight and flight. Eventually, you will too. The PTSD will affect you as your marriage has become the battlefield. I know you didn’t realize this was what you were signing up for, but neither did he. Go to the therapist and keep yourself healthy and strong. You can remind your husband that his mission has ended and he now has a new one (his family), by not appearing to be his enemy. Grace and more grace. Grace for yourself. Do not expect your husband to rescue you…only God can do this. Once you let go of certain expectations you will be better off. Parenting isn’t easy with PTSD. The kids won’t understand it’s not their fault unless you tell them. They will need a lot of help. And it is healthy for you to set boundaries with your husband. Try not to give into fear. Your husband did not turn into a monster. Remember that he is a noble man who chose to sacrifice not only for your family but everyone else in this country. You can trust him to be a Dad…just be wise….help him to be gentle and remind him the kids are not the enemy. Your youngest will need to be told one day of what his father went through…what you all went through. Show him pictures. He is so blessed to have had his dad for all the special events. Remind your kids of how much their Dad loves them. Do not expect civilian life to erase the war and don’t expect the transition to be easy. You will always feel different from civilians. You’ve experienced something many don’t understand. Times are going to be hard. Your husband is going to struggle to find a job and the one he gets will barely get you by. You’re going to have to be humble and accept help. The uncertainty will be scary but you will both grow closer through it. Support your husband as he works hard. Be frugal and wise with your money. I know you will find joy in the simple things. We make more money now but that doesn’t make us happier. Life is made of more than movies and grand feasts. You’ve lived on very little. One day you’ll be amazed at how God stretched your $50 grocery budget and fed your family of three. You’ll have plenty of opportunities to show your husband you are his ally when he goes back to college. He will need your encouragement to push through. Be his cheerleader. Don’t worry. One day you will be settled. Just remember not to get too comfortable. Never forget the hard times that you’re built upon. Years from now you’re going to have lived through many hardships with your husband…some harder than the war. You will bury family members, struggle financially, deal with chronic illness, and go through the pain of infertility. You will also have much joy. You will see the Hand of God as HE holds you through the good and the bad. You will see miracles. Your dreams that seem dead now are just buried in the dirt and ready to burst forth. The child you pray for will come. ..the missions trip you always longed for will happen. New dreams will awaken as you learn to be the writer you always wanted to be. I know that you can make it through these hard times. Cling to the good moments you have NOW. Kiss every letter he writes. Enjoy hearing his voice after a lockdown. Praise God every time your husband checks in to say he is alive. Enjoy the friends you will make. Praise God when their husbands are safe. You will never forget these sisters…even though you are just passing through each others’ lives. Enjoy the new hobbies and adventures you are experiencing during deployments. This is a unique time. You will learn to adjust to having your husband back. You will learn to let go of the control and independence you’ve relied on to survive. 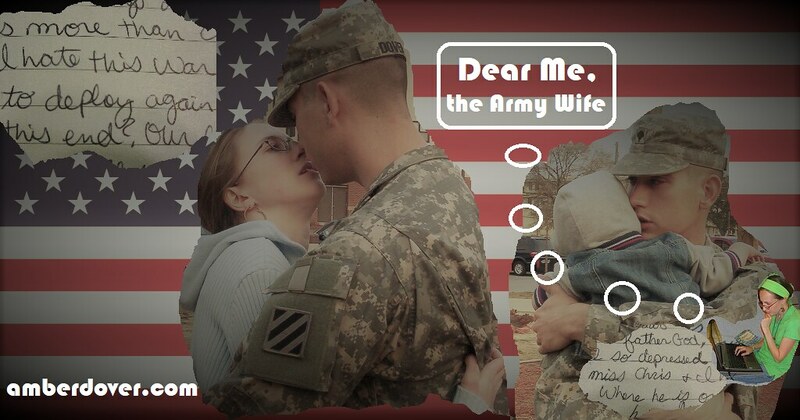 Be proud and thankful for the accomplishments and the ways you’ve grown during your time as an Army Wife. You’ve seen God do a lot through you. He is your strength. In the loneliness, you have found a deeper relationship with Jesus. Treasure this and never forget that it was your LORD who held you in the trenches. Don’t forget HIM when the sun starts to shine again. Yes, your journey has just begun. The war will not end in this life, but you still have God holding you and walking beside you. You now have new struggles. Your God can handle them all. Your marriage survived the beginning of the war. Don’t lose hope when you get near the end. It may take awhile and a good bit longer than you planned…but one day there will be eternal peace. Hold on. Remember your allies and remember who the real enemy is. Keep pressing on Soldier. You will make it home. *The flag background in my cover picture comes from Wikimedia Commons. Thank you to the photographer.